This newly renovated condo is in a great, peaceful location on property. Featuring a brand new kitchen, with gorgeous granite counter tops, you'll find all of the necessary cookware and utensils to make this condo your home away from home. New tile installed in 2013 throughout the condo. Bedroom features air-conditioning, so even in the warmer summer months, you'll stay cool and relaxed while lounging about this comfortable condo. This unit has a cozy queen bed, as well as a queen sofa sleeper--this condo is perfect for small families! Maui Vista Resort is located in South Maui and is across the street from Charley Young Beach. Located on the north end of Kamaole Beach I, the soft white sand of Charley Young gently slopes into the water, making for a fantastic family-friendly swimming beach. Strolling down the sand, you'll find amenities such as out door showers, restroom facilities, picnic tables and charcoal grills, a life guard stand, and an open beach volleyball court. 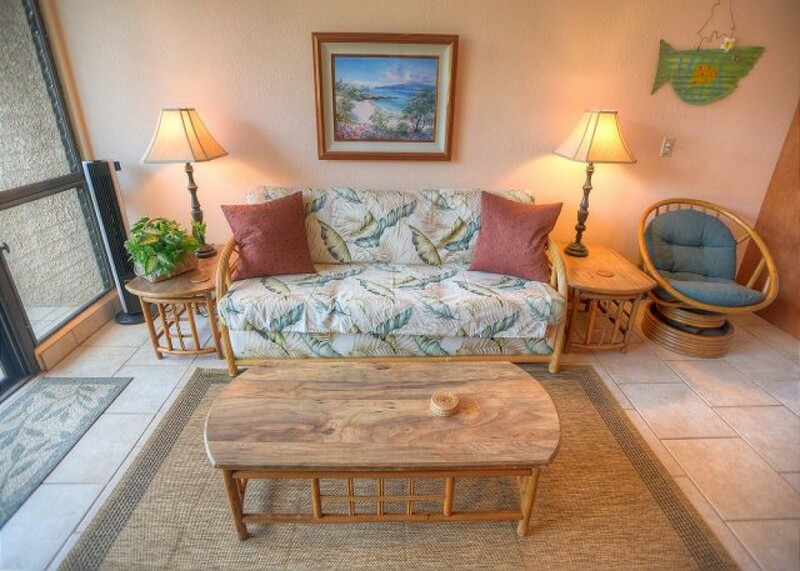 Each of our Maui Vista condos come with two beach chairs per bedroom, two beach towels per bedroom, and one large beach umbrella for guest use. The Maui Vista resort offers 3 pools with sun deck and lounge chairs, multiple tennis courts and equipment rentals, on-site activities guide, community propane grills and lovely gardens and grounds. A wide variety of restaurants and great shopping are within walking distance, and our reservations agents are happy to give you ideas of sights to see, activities and adventures nearby, and the best local favorites for breakfast, lunch and dinner. 20% down to hold a reservation. Balance due 45 days before check-in. Holiday and peak season rates and required lengths of stay may be different than quoted above. Credit cards, check, and money orders are accepted. Minimum night stay varies among the rental properties.